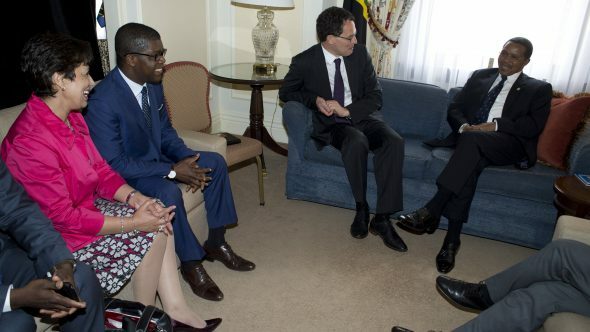 (Toronto) - A delegation from the African Institute for Mathematical Science - Next Einstein Initiative met with H.E. 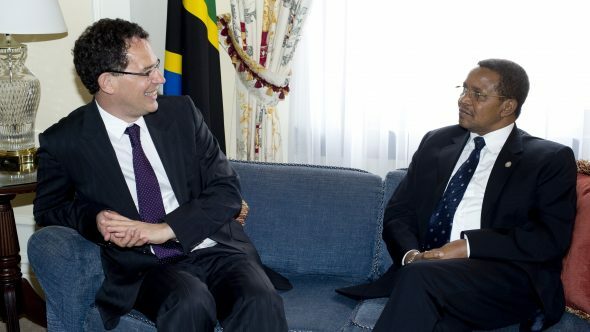 Jakaya Kiwete, President of Tanzania, and his Minister of Education and Vocational Training, Shukuru Kawambwa on May 30 in Toronto following the Canadian Summit on Maternal, Newborn and Child Health. The group met to discuss plans for a new AIMS centre in Tanzania. 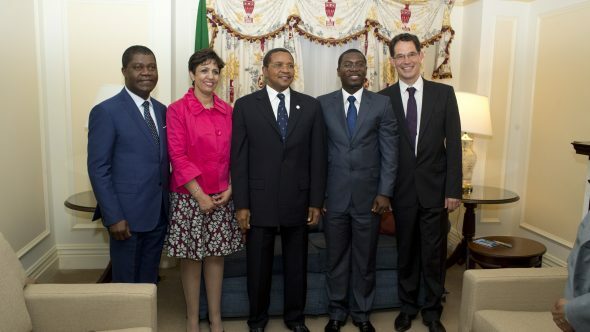 The delegation included AIMS Chairman and founder Neil Turok, Executive Director Thierry Zomahoun, Director of Strategic Partnerships Dr. Habiba Chakir, Director of Development and Public Engagement at AIMS-Tanzania Sam Awuku and Canadian Member of Parliament Joe Daniel. The President met with the delegation immediately following the closing press conference with Canadian Prime Minister and summit co-chair Stephen Harper and United Nations Secretary General Ban-Ki Moon. The meeting was held at Toronto’s Royal York Hotel in the heart of Canada’s largest city. The president and minister were joined by H.E. Alex Massinda, High Commissioner of Tanzania to Canada, Hon. Ramadhan Abdalla Shaaban, Minister of Education and Vocational Training for Zanzibar and Prof. Sylvia Temu, Director of Higher Education for Tanzania. Temu recently attended AIMS’s official launch of AIMS-Cameroon in Yaounde in February. The expansion is timely as Tanzania is experiencing rapid economic growth. Its economy at $31.9 billion (USD) grew 7.0 per cent in 2013. Tanzania’s economy is projected to grow by 7.2 per cent to $34.9 billion (USD) in 2014. As a result, the demand is exploding for a generation of youth that can apply science and math to ensure rapid and stable social and political development. Yet, only six per cent of post-secondary aged Africans are enrolled in apprenticeships, colleges or universities, compared to the global average of 26 per cent (UNESCO Institute of Statistics, Montreal, 2010). In Europe and North America the enrollment ratio is as high as 80 per cent. The AIMS-NEI is playing a major part in closing this gap in Africa, by opening centres of excellence for training, research and outreach. The plan is to create a network of 15 centres across Africa graduating more than 1,500 mathematical sciences experts - half will be women - annually by the year 2023. AIMS public engagement programs spread the word about the ways maths and science can help to build a better future for all.